The projects will be hosted at the offices of Cogniance in Kyiv; SmartJS.Academy in Kharkiv, while in Lviv a location has yet to announced. Groups will consist 30 people, with applicants having to apply on the community website. They will need to pass a test which can be solved through basic school knowledge and advanced ability to google, said Kottans representative, Artyom Sychev. Learning materials are available on open access programme GitHub. 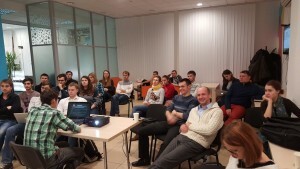 “Our graduates work at Google, Amazon, eBay, Materialise, RailsReactor, Aejis, RubyRiders, actively participate in and organize conferences, and in community life,” said Sychev. According to him, the competition is usually 10 people to each place. On the last course on the C# community, they received 400 applications. However, only 10-15 people complete their education. The course is designed for those who are interested in programming, who want to grow and develop. On Frontend, students get introductory knowledge of HTML / CSS, basic for JS, familiarity with React, Angular, Ember, Node, Building API, Testing in JS. All theoretical knowledge will be backed up by practical exercises. The course lasts several months and classes are held 2-3 times per week in the evenings. It is a non-profit initiative which exists due to the time and money of other members of the community.